What to do when you've made them? Go to the Oatcake Recipes page. Although we are not offering you our recipie, we believe we can offer you the next best thing...the same Oatcake mix we use ourselves in our shop, including all ingredients, with easy to follow instructions, and just like all Oatcakes, it is suitable for Vegetarians. We supply you with 354g of our real mix which is enough to make approximately one dozen (12) Staffordshire Oatcakes, or an 708g pack to make approximately 24 Oatcakes. 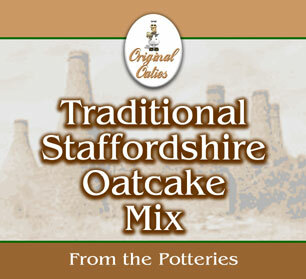 go to the Staffordshire Oatcakes Online Store.